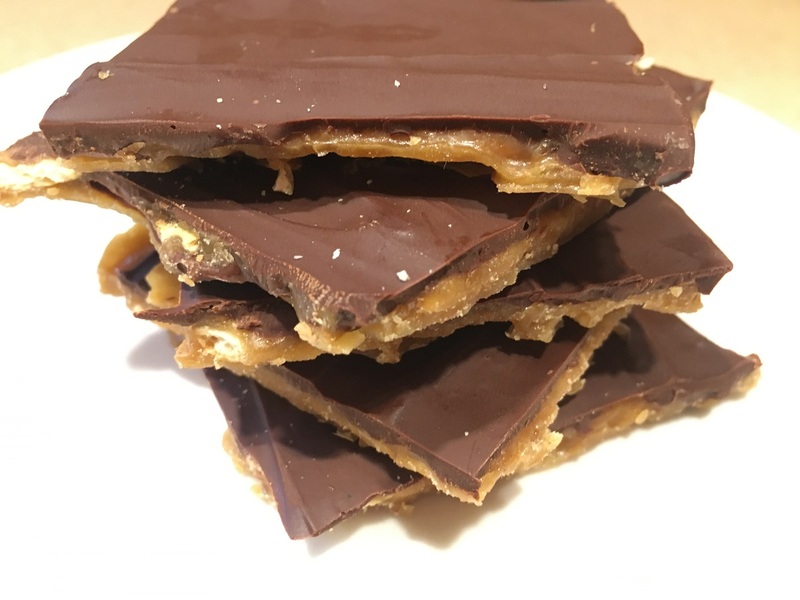 I have a delicious new recipe for you to try: Saltine Toffee. Be careful though, these can be a little addicting 🙂 Well, maybe a tad more than just a “little” addicting. I just can’t seem to get enough of them! Thank goodness for my YMCA membership to help me keep the extra pounds eating these SCRUMPTIOUS treats! They are both super easy to make and don’t take a whole lot of time! They are a wonderful crunchy blend of sweet and salty. The thing I like most about them – aside from the taste – is that you can make them with all organic ingredients! Finding organic candy and treats can be pretty difficult, especially chocolate ones. Now you can make your own amazing chocolate candy! This recipe actually calls for saltine crackers, but organic saltine crackers can be hard to find. So, I’ve tried this recipe using organic stone ground wheat crackers and organic wheat thin crackers and they both turned out amazing. Maybe even better than the saltine crackers the original recipe calls for. When I make saltine toffee, I only use 1 package of chocolate chips instead of the full two cups. I like it better with a thinner layer of chocolate, that way you can taste the other flavors better. I first found the recipe for saltine toffee here at Suburban Simplicity. It tasted great as is but I made a couple slight changes to make it easier for my organic cooking needs/preferences. You can top this treat with chopped nuts such as pecans, almonds, or peanuts. But these are only suggestions; I think it tastes great without! *Tips: Can be made without organic ingredients. The Safeway brand organic semi sweet chocolate chips are dairy-free if you can’t have milk. Can be stored in the refrigerator for up to 2 weeks or stored in the freezer for 2-3 months. Line cookie sheet with a silicone mat or parchment paper. Place crackers flat on cookie sheet until cookie sheet is completely covered. Combine sugar and butter in saucepan over medium high heat until boiling. Boil for 3 minutes. Immediately pour over crackers and carefully spread until crackers are completely covered. Let sit for 5 minutes, then spread melted chocolate until completely covered. If desired, sprinkle with chopped nuts.